My heart was ripped out, crushed, and cut by a thousand blades on Thursday night. What started out as a little screen time after putting the kids to bed became a cry fest of epic proportions -- leaving me hollowed out and stuffed up in my sinuses from all the tears and emotions. I watched the program, "20/20". I have our DVR set to record this weekly show, and I had watched about 1/3 of the program a few days earlier -- which was entitled, My Extreme Affliction, focusing on physical issues that have extreme consequences who have them. However, it was the remaining 1/3 of the program that I sat down and watched on Thursday night that gripped my heart so tightly. The episode travels to Tanzania, Africa (a country near and dear to my heart) to one of the largest populations of Albinos in the entire world. Not only do these people have to deal with the very real issues of their genetics, but they are literally in danger of their very life and limbs. For some reason, in this country, witch doctors decided that the body parts of people who have Albinism is necessary for certain potions. These body parts have since become extremely valuable and sought after. At first, people did some grave robbing to get what they wanted. But once they ran out of bodies to plunder, they started going after the living. I heard about this first-hand when my family traveled to Tanzania in 2008 for a family reunion of sorts. My grandparents pioneered a church and Bible School in Arusha in the 1950's, and as both of them celebrated their 50th anniversary, our extended family was invited to participate in the celebration. 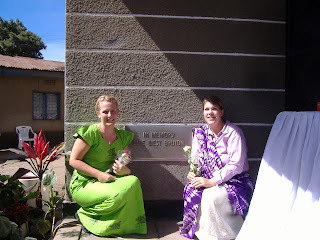 My sister and I (in the purple) at the church in TZ. It was my first visit to this continent and to the country of Tanzania. However, it felt a little bit like home because I've grown up on stories, photos and videos of my grandparents and my father's life in this country. I felt an instant connection and kinship with the people of Tanzania -- a love that has grown since that visit. During our trip, we were blessed to be able to go on safari for a few days during the trip and as we drove out of Arusha to the Ngorongoro Crater area, our driver told us about what was going on with the Albino population. My sister and I were flabbergasted and horrified. It bothered me, but then there was a lot to be bothered about on our visit as we witnessed some of the poverty and lack that people deal with in that country. But I have been reminded once again. I cannot tell you of the heart-break and heart-wrenching feeling I have in my soul over the atrocities committed against humanity by their own neighbors under the spell of witch-craft. The stories told of women maimed in front of their children who have borne it because they have been threatened with the killing of those children if they resist is simply mind-blowing. I dare anyone to watch the segment of the Tanzanian reporter who first brought this plight to the attention of the world media as she describes an incident that happened with a baby with Albinism being taken from their mother without having a complete emotional breakdown. As a mother, my heart literally shattered to think about what that would feel like -- to be so helpless as your child is destroyed for the sake of demonic influence. The sad and inspiring story of another victim, Mariamu, was bittersweet for me as I watched her personal tragedy turn into redeemed joy. The last shot of her hugging her young son completely undid me, and I had to leave the room to sob in my bathroom as I cried out to God about why there is so much evil and suffering and to help the beautiful country of Tanzania and to help me do something to make some sort of a difference. At that moment, I wanted to sell everything we have and move our family over to Tanzania and love on those children with Albinism. I know that's not practical right now, but I do know there is something I can do about this situation. First of all, I have family who is actively working in Tanzania with a non-profit they created, and I know that I can get funds to where they can be most useful. I'm working on that. Also, through other friends, I have found a missionary couple that is actively working in a school for children with Albinism to provide much needed supplies and continued protection. 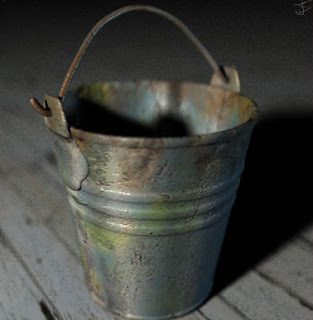 I may not be able to do something personally about the ocean of suffering and sorrow out there in the world, but I was reminded this last Sunday, that I have been given a bucket. My bucket may not be able to empty out that ocean, but I can be diligent and purposeful to use it to alleviate some of it. May I never allow the crusty callous of indifference to grow upon my heart. May I always rise up and take that bucket in hand and head back to that shore line. May God cover those who have suffered by the hands of those who have evil in their heart find peace, safety and healing. May God bless Tanzania and her people.